Nokia 3310 variant launched for a whopping Rs 1.6 lakh, but would you buy it? Update: Nokia 3310 variant launched for a whopping Rs 1.6 lakh, but would you buy it? To commemorate the meeting of Presidents of US and Russia at the G20 Summit, Russian phone customiser has launched a luxury Putin-Trump Summit Edition of HMD Global’s Nokia 3310 feature phone. 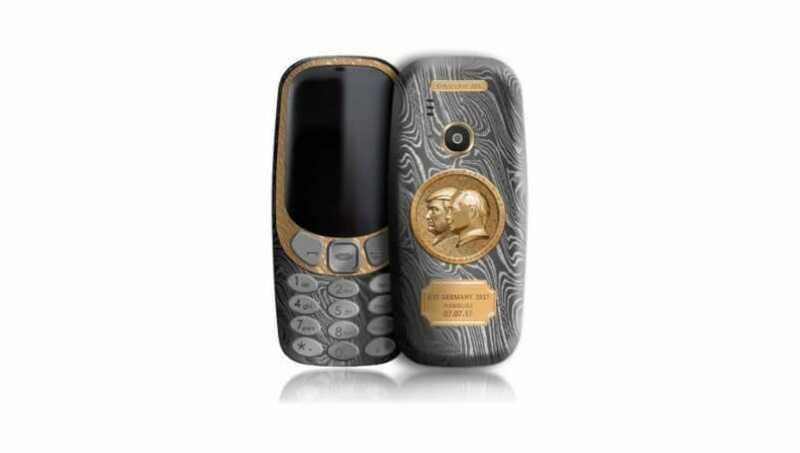 The Putin-Trump Summit Edition of the Nokia 3310 features a gold plated coin-like emblem with Donald Trump and Vladimir Putin’s face on it. The phone is said to be available with a price tag of $2,468 which roughly translates to Rs 1.6 lakh. The standard Nokia 3310 is available in India for Rs 3,310. The new edition brings about only cosmetic changes, and there are changes to the phone’s specifications. In terms of design, the phone is carved out of titanium and black velvet, and is therefore expected to be sturdier than the standard Nokia 3310. Caviar says that the emblem placed at the back panel shows both Donald Trump and Putin looking in the same direction, which shows the common desire for progress in Russian-American relations. Besides the tweaks tot he design, the rest of the aspects remain the same. So you get the Nokia 3310 with a color screen, and the iconic Snake game too has been given a modern touch. In terms of specifications, Nokia 3310 comes with a 2.4-inch QVGA display. It runs on Nokia Series 30 platform with 16MB internal storage, which can be expanded up to 32GB. Nokia 3310 sports a 2-megapixel rear camera with LED flash. It supports 2G connectivity, dual-SIM card slots, 3.5mm audio jack, a built-in MP3 player and FM Radio. The phone is also armed with a 1,200mAh battery, which the company claims is good enough to offer a standby time of up to a month and talk time of up to 22.1 hours. Additionally, Caviar has also customized a variant of the Apple’s 2016- flagship device. The Putin-Trump edition of the iPhone 7 and iPhone 7 Plus has been launched with prices starting from $3,050 (approximately Rs 1.97 lakh).